I like these. I ordered 2. They are lighter weight - or thinner - than the other duvet covers I have, but I am using a heavier comforter and summer is coming! I wash these regularly and have not lost a button!. My cats sleep on my duvet covers (the reason I cover the comforter) and the hair comes off easily and I am not getting many pulls. Snuggle up for a comfy night's sleep with this three-piece duvet cover set. 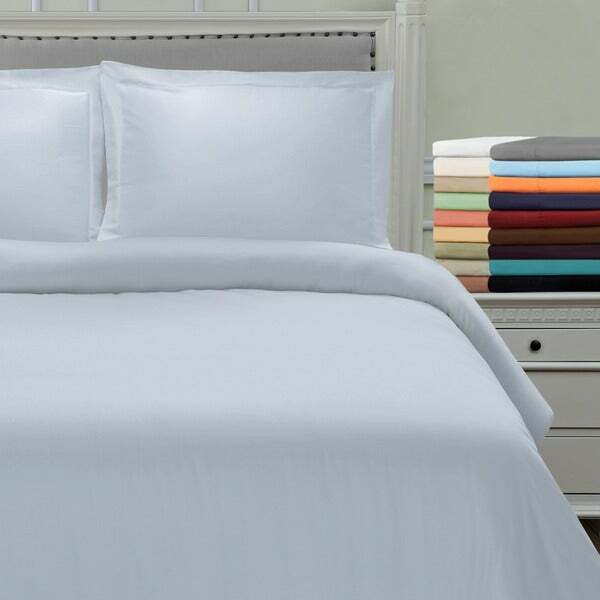 Made of microfiber, the set is luxuriously soft and plush, ensuring a cozy night's sleep. The set is available in a range of colors to match your decor, and everything is machine washable for easy cleaning. This is very, very soft- however, it's thin with alot of extra fabric for the comforter to move around in- no inside ties- but we put them in- its soft beyond belief, & I really got it to protect my down comforter ( it's cheaper to buy this duvet than it is to send my down com to the cleaners & this does the trick. ) One little trick I learned several years ago: when buying a duvet for a down (or maybe any kind) comforter- order the duvet ONE size down. That way your comforter will fill it out much more nicely! Been doing it ever since & works like a charm. Be sure to sew ties in the inside duvet corners ( or shoestring) to tie around the corners of the comforter to keep the comforter from "traveling." I bought this in good faith, thinking it would be as described. When it arrived it was shrink wrapped, the box and invoice stated, Cal King, 72x84 6 inch. When I opened it, even though the mattress tag stated same info. The bed was square, not rectangle as a Cal King is. The height/thickness was 4 inches...not 6inches and there was NO WAY it would increase to 6 inches. I am not sure if this was irregular or not. But please don't buy bedding that you can't SEE, and please make NOTE of the return and refund processes on bedding here. I decided to write this review even though i NEVER write reviews. I couldn't decide on this duvet cover or another at the same price. I read the reviews for both, positive and negative. The complaints on this duvet cover were that the comforter moves around and there is excess room, the quality is poor, there are no ties inside to keep the comforter in place, and etc. On the positive side people said that it is very soft. This is the truth: The duvet cover is extremely soft, well made, and the color is exactly as in the picture. Right away i washed the duvet in warm water and put it in the dryer for a while. I took it out and it was as soft as ever and in perfect condition. In addition, when putting my comforter in there were ties inside the duvet cover to keep your comforter in place on all 4 corners. So the people that said there weren't any ties inside maybe didn't look well enough (its not like they're hidden). I have a queen size bed and comforter, and the duvet cover fits it perfectly. The 2 pillow covers that came with it are also super soft. I recommend this duvet cover and don't let other people's negative comments deter you. They almost deterred me. Thank you. Absolutely gorgeous duvet cover set. Great quality, beautiful rich color (I purchased "plum" color), very soft microfiber material, and easy care. And all for a great price. Could not get any better. I love it and would buy it again! Runs large doesnt have a microfiber feel. I ordered two of these in white, king size. They are very nice, they go on the duvets very easily and have a button closure. I didn't even iron them or put them in the dryer...they smoothed out in a day or two. They are plenty large to cover a 106" wide duvet, and look great. We don't have deep mattresses, just 12" so if your king mattress is deeper they won't be wide enough. I did quite a bit of research for a duvet cover. I am always nervous to find what is really going to come in the mail. I got exactly what I expected. Last year I shopped for months for just the right bedspread, so am using my duvet as a blanket, so wasn't as concerned about the perfect look, just wanted good quality, good fit, comfort and easy to put on. I was concerned about the fit since it says King/California King, but it fit my Costco king duvet perfectly. Button up closure works fine. It does wrinkle where I sleep with it under my chin, but not sure if you are going to find a duvet cover that doesn't. Very soft. Haven't washed it yet, but will wash it separately. I liked it so much I had my mom buy one for her queen. Her queen didn't fit as perfectly on duvet, but it was fine. She is happy with it. Ties work fine in holding cover on duvet. I recommend this cover, especially for the price. With all of the pillow tops and closed cell foam pads on my queen sized bed, my original (and expensive!) bed set looked a little like the Incredible Hulk as he was breaking out of his clothing! So I needed a quick fix as the house is on the market. This great set is just perfect! It is an excellent sage green and the fabric has such a beautiful soft hand that it is more luxurious to the touch than you would think! The color is perfect. So my solution was to buy the king size which is really, really abundant - and use the original duvet as a bed scarf at the bottom of the bed with all of the pillows and shams from the original set. It truly has a designer look to it. Don't be afraid of the price point. It is made very well from wonderful, soft fabric. The sizing is great and the color is excellent. This was a great deal! I ordered this duvet cover because I did want to pay the expensive designer prices I had seen online. For the money this is perfect and the neutral color I ordered is true to the description. It is very soft and was delivered quickly. Beautiful rich eggplant cover but pet hairs sticks - will attract hair from anywhere. The pillow covers are strange - pillows flop out. Seems to run a lil big but I washed once and it is a very soft duvet color with rich color. I selected the plum. This set is fine for me as I am using it in my guest room. The material is more like a thin sheet sewn as a duvet cover. I think it would wear out quickly if it were to be used nightly. I received the ivory color set punctually. The fabric is thin and flimsy. The duvet is so thin that the comforter I inserted shows through to the outside of the duvet. This was definitely not the effect I was hoping for. This duvet would only work with a white comforter inserted into the duvet. Such a great purchase. I got the purple set, and it's such a deep, rich color- so pretty and so soft! I highly recommend it. It is OK, very soft. You get what you pay fo. I purchased this to go over a comforter I purchased at the same time. Has stood up to many washings and still looks good. Easy enough to get on the comforter. This has been a good purchase for our vacation rental. It seems to be holding up well so far with multiple washes and it had a nice crisp but soft feel and look to it. "Hi there, what are the true dimension of the silver California king cover, please? I am in need of a true California king cover which in centimeters must be 285 X 210 at least. Regards"
"What do I actually put inside of the"duvet cover"...I have a California king bed.. So do I just put a Cal King comforter inside of it?" I put a king size down comforter inside of the duvet cover. The comforter is white and filled with tiny little feathers, so it is protected by the duvet cover. That way, the duvet cover can be washed without the need to wash the down comforter also. It is a nice way to protect and match colors of the room at the same time! I put a alternative down comforter. It had plenty of room for the comforter and was very soft. My mother (and myself) who this duvet was for loved it..
"The "tan" color looks more like a light grey, is that accurate? im looking for a light grey rather than a light brown/beige/tan color"
"Is the white duvet cover see-through? My comforter right now is red and i'm wondering if the white duvet cover will show any of the red?" I bought the white and yes you would be able to see the red. "The picture shows a red duvet. Description says Red in the list of colors. No mention of burgundy as a color. So I thought when I went to order it was a typo when I had to choose burgundy as I saw no red listed. The package came today and it is NOT RED. Do you have RED? How can I return this product as it is not the color shown." Hello LJ, we apologize about your duvet. You will be contacted by Customer Care. Have a great day! "The pictures show a lovely charcoal grey but the closest selection listed is Silver - is that the correct option?" Hello LittleMissyBird, please see the second photo to see each color listed on the actual item. This item is a very popular set and has some great reviews! Thank you for shopping with us. "Is the plum a dark purple? Please let me know. Thanks!" Hello Tara27, yes the plum option is a Dark Purple. Please let us know if you have any further questions.